A Rule for Children and Other Writings, Pascal, Conley, S.J. Edited and Translated by John J. Conley, S.J. Jacqueline Pascal (1625-1661) was the sister of Blaise Pascal and a nun at the Jansenist Port-Royal convent in France. She was also a prolific writer who argued for the spiritual rights of women and the right of conscientious objection to royal, ecclesiastic, and family authority. This book presents selections from the whole of Pascal’s career as a writer, including her witty adolescent poetry and her pioneering treatise on the education of women, A Rule for Children, which drew on her experiences as schoolmistress at Port-Royal. 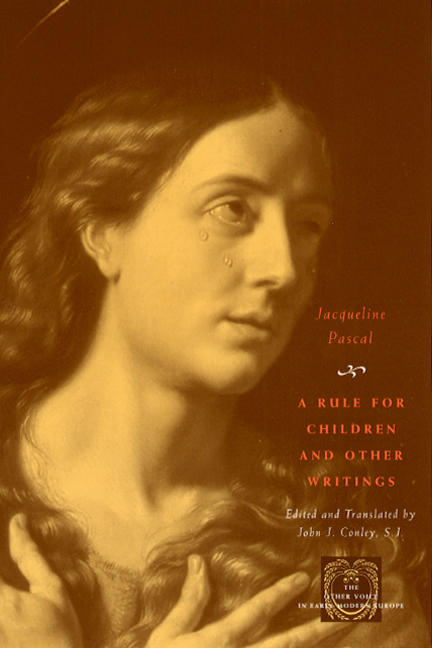 Readers will also find Pascal’s devotional treatise, which matched each moment in Christ’s Passion with a corresponding virtue that his female disciples should cultivate; a transcript of her interrogation by church authorities, in which she defended the controversial theological doctrines taught at Port-Royal; a biographical sketch of her abbess, which presented Pascal’s conception of the ideal nun; and a selection of letters offering spirited defenses of Pascal’s right to practice her vocation, regardless of patriarchal objections.